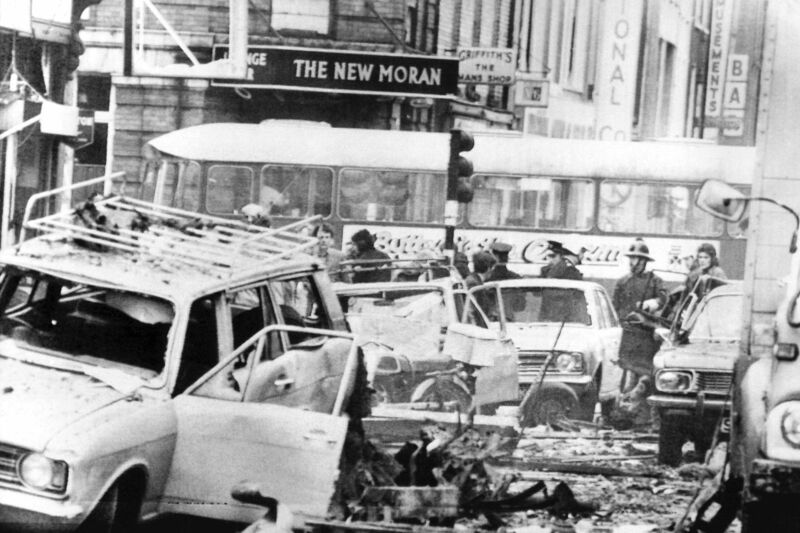 On the afternoon of the 17th of May, 1974, as rush-hour commuters made their way through Dublin’s city-centre, three car-bombs exploded within the space of four minutes. The streets were filled with an unusually high number of pedestrians and vehicles due to a planned bus-strike and the targeted locations, Parnell Street, Talbot Street and South Leinster Street, were on the main routes to the local train stations. The obvious planning and forethought put into the attacks had the desired effect, leaving twenty-six dead and nearly 300 wounded. Approximately ninety minutes later a fourth car bomb detonated in the market-town of Monaghan, resulting in seven deaths and dozens of injuries. The resultant carnage overwhelmed the emergency services in the counties of Dublin and Monaghan, chaos gripping the Gardaí, ambulance and fire crews, and the hospitals. Indeed, the point of the quadruple-attack was obvious to many, a brutal “lesson” to the authorities in Dublin that the general “toleration” of IRA activities by the population in the “south” would eventually draw a bloody response. Within months of the terror strikes the Irish authorities were aware of the source of the car bombs, a section of the extremist Ulster Volunteer Force (UVF) operating in mid-Ulster and nicknamed the “Glenanne Gang”. Furthermore by 1975 the government in Dublin was also aware that this amorphous terrorst grouping included serving and former British soldiers and policemen, and was closely linked to the counter-insurgency operations of the UK intelligence services. With evidence mounting, not just from investigations by the Garda Síochána and Defence Forces Ireland, but also from information supplied by the Irish Republican Army and sympathetic members of the Royal Ulster Constabulary (RUC) in the north-east, the Fine Gael-Labour coalition knew that the trail for the Dublin-Monaghan bombers was leading all the way into the heart of Britain’s ruling establishment. Fearing reactions should the information be made public, and a renewed groundswell of support for the IRA’s armed struggle surpassing that following the Bloody Sunday Massacre of 1972, the government of Ireland initiated a cover-up, hiding the UK’s role in the slaughter of its citizens. This was to set a pattern that was to be repeated over and over again throughout the next two decades of conflict. In the 1990s the names of the UVF killers behind the 1974 Dublin and Monaghan bombings were revealed to be William “Billy” Hanna, Robert McConnell, Harris Boyle, David Alexander Mulholland and Robin “the Jackal” Jackson, all serving soldiers with the British Army. Jackson was also identified as a close associate of senior RUC commander Harry Breen and Robert Nairac, a member of the UK’s covert Special Reconnaissance Unit (aka. 14th Intelligence Company), a military death squad. The materials and know-how for the bombs likely came through Nairac, and they were constructed on the farmland of James Mitchell, a police officer, before being transported southward in vehicles procured by William “Frenchie” Marchant, a UVF boss in Belfast. None of the above individuals were ever charged or brought to trial for the atrocity, though most suffered violent deaths in the years that followed. My mother was in town the day before. It was ages before she returned. It’s remarkable the way the political and press classes managed to almost bury all memories of the atrocity until recent years. I remember the history book on the bombings being sold door to door around Dublin in the earlyish 2000s. My ex-girlfriend bought a copy and was outraged by what she read. It’s changing but a lot of the “mainstream” media passed over the 30 year anniversary in 2004 with stony silence. 2024 will show if anything really has altered from the self-censorship of the last four decades.